- What Kind of Bottle for me? - Relax! Henna is Fun! There is always something new to be learned about the art of henna! New information can get lost on a site this big, so I thought I'd keep a running log of new tips and tricks for you. Some tips will be from my personal experiences with henna, but some tips will come from your fellow henna artists out there. If you would like to send a henna tip or henna pictures, just send me an email. Feel free to include a picture of yourself or a link to your website. You asked...we answered! I'm happy to offer yet another product brought about by customer requests! Finding the perfect cellophane is tough. Trying to cut it perfectly without getting dirt, hair, and other contaminates on it is REALLY tough! I understand because I have always hated rolling my own cones because of this. Now you can get perfectly cut triangles, that are the perfect thickness, super-cheap from us! We offer two sizes of cellophane triangles. You can get 25 cello triangles for $3.99 or 100 cello triangles for only $8.99. Add these to any order and they don't add any shipping costs. Purchase them alone and it's only 2.99 to ship in the US! Learn to roll these fabulous cell henna cones with the lovely and talented Brenda of Bajidoo in this video. Be sure to check out all of the Bajidoo henna videos. She has some wonderful henna design videos along with how-to henna videos. You can twist the cone to adjust its shape. I've been noticing some people with questions about henna dye release on some of the henna groups that I follow so I thought I'd address that here as well. Every type of henna has a different dye release time. It can take anywhere from 4-48 hours (or longer) for dye release depending on the henna brand, the temperature, and what is mixed with your henna. The warmer the temperature, the quicker the dye release. If it’s colder, it will take longer to achieve dye release. The more acidic the liquid mixed with the henna the slower the dye release (and demise). The less acidic the liquid, the quicker your dye release. The times below are based on using lemon juice to mix your henna. Note: Generally, the longer the henna takes to release full dye, the more stable the henna and the longer it will take the henna paste to start losing it’s dyeing abilities. This is one of the reasons Jamila henna is so very stable and has such longevity. a. When the top of the henna has a nice brown skin with the fresh green henna under the surface, your dye has been released. Double check these results with one of the below methods. b. Place a paper towel on top of the plastic wrap. When there is a nice orange stain on the paper towel, you have dye release. c. Place a small dot of henna on the palm of your hand. Leave it for a few minutes and wipe it off. If there is a nice orange stain, you have dye release. This is the MOST reliable dye release test! You will need to experiment with your specific situation to find the optimum dye release time for you henna. Don't get too crazy about it. It's generally hard to over-release your henna dye, though it can be done. Most problems with dye release are because the henna was not left out long enough, and the dye is not fully released. Have some fun and relax! You'll get it! WOW! Really, 3.2% lawsone content. Even higher than Jamila henna powder! Get the best of both worlds by mixing half Rajisthani paste and half Jamila paste. You'll get that fantastic Jamila smoothness, texture, workability, and stability and the darker stain color of the Raj henna! PERFECT! Did you know we now offer henna design eBooks? Our eBooks are in standard PDF format and are designed to printed out on normal 8.5 x 11 paper. This is great for henna artists because you can print out multiple copies for your festival books. We currently have 4 eBooks with more to come. This eBook is specially designed to help you learn the vocabulary of henna tattoo designs by breaking down designs into the basic elements of henna design. A variety of complete designs using these henna elements from easy basic designs to moderate level henna designs. Great for individual use along with some good festival style pages as well. This eBook is specially designed to be used for events such as fundraisers or festivals, with the beginning henna artist in mind. The henna designs in this design book are quick and easy to create It's packed full of information to help the henna newbie through their first couple of events. Designs range from super easy to moderate. Nothing too complicated! This eBook has a little bit of everything! Most of these henna designs are of a moderate or intermediate skill level, so with some practice even a henna beginner can learn all of these. Modern interpretations of henna designs and henna styles are featured. Each page is very different from the pages around it to give you a massive variety of different henna styles done in fresh modern ways to spark your imagination. You will find both higher-end festival pieces along with great henna party pieces. This eBook focuses on more skilled and intricate henna designs. You know, the kind that will cramp your hands until you are practiced! Designs range from moderate to challenging henna styles. A variety of styles are represented including lacey Indian style wedding henna, bold Arabic floral henna, geometric African henna, and modern fusion henna. Some of these pieces look more difficult than they really are to henna, so try them all! Keep your eye out for more eBooks to come! Though we've had the 2011 Jamila henna since the first week of July, I still feel as if it is brand new! I am still so excited about the Jamila henna crop this year. The Lawsone content (dye content) weighs in at 2.64%! Let me put this in perspective for you. Most average henna is 1.7-2.3% dye content. Anything over 2.5% lawsone is considered excellent quality henna. New packaging! Gone is the holographic packaging. Instead we have a slightly larger box (though the henna is still vacuum sealed in Mylar bags) and is marked on the bottom of the box with the crop and dye content info. The henna design above was on difficult-to-stain me! The paste was on for 3 hours, with no sealer, no wrap, and no additional heat! Can you spell AWESOME! Woo Hoo for 2011 Jamila! Are you in a henna rut? Seem to be doing the same design over and over? It's a whole new year, let's get out of that box! Challenge yourself to do your henna differently. Always do flowers? Practice henna designs without a single flower. Can't seem to master the perfect paisley. Do only paisleys until you get it right. If you don't already have a henna notebook, get one. Any grouping of paper will do, a notebook, a folder of paper, whatever. Start filling it as designs strike you or as something inspires you. Print out some of our blank henna hand templates and draw out some henna designs. Get crazy here! If you don't like it you can toss it out. This is a wonderful way to try something new with no commitment. If you like it commit the design to skin with some henna! The point is to try something new! Stretch your creativity! Two of the women in class are regular henna customers of mine and allowed me to demonstrate an important fact about henna color. Two days before I gave both Stacy and Shannon henna tattoos. Stacy didn't put any lotion on that day so I hennaed her without cleaning the area first. I used witch hazel to clean Shanon's skin since she had lotion. Stacy's henna was brilliantly dark and lovely. Shannon's was rather lack-luster. The exact same henna, the exact same day, and both designs done on the foot and ankle area. Another thing brought up was how the henna tattoo stain on my hand was so dark. The full answer to that is here Henna Tattoos - Extra Dark Color, but though my henna was very dark, it wasn't going to be a long lasting stain. I only left my henna on for less than 2 hours, just long enough to do the design and finish a movie I was watching. Though I still got nice dark color from my henna, it started fading MUCH quicker than normal. By the 4th or 5th day the henna was starting to fade. Granted I was also in the process of installing drywall in our house and was mudding and sanding the drywall. This meant plenty of hand scrubbing throughout the day. Typically I can expect at least a week of nice deep color from my henna. Download & print this article from our FREE Helpful Henna Downloads page. Back to dark color henna! There are many many factors that contribute to the color you ultimately get from your henna, we're going to address most of them. One hundred grams of henna powder will yield 75-150 henna tattoos depending on the size of the designs you create. If you are new to henna, I suggest mixing smaller batches (25-30 grams), so you can play with your henna recipe to find what works best for you. Mix approximately equal parts henna and lemon juice (bottled lemon juice, such as RealLemon). For 100 grams of henna, you will use 1-1.75 cups of lemon juice total in your recipe. For the first step do not mix all the lemon juice. You are looking for a really thick texture like thick mashed potatoes. The henna should be too thick to use, as we’ll be adding more liquid later to our mix. Why? The acid in the lemon juice releases the dye in the henna (lawsone). Apply plastic wrap over henna and press down so that the wrap touches henna paste to remove as much air as possible. Set aside in a warm area to await dye release. It takes different amounts of time for different types of henna to release dye. It can take anywhere from 4-48 hours (or longer) for dye release depending on the henna and the temperature. The warmer the temperature, the quicker the dye release. If it’s colder, it will take longer to achieve dye release. Note: Generally, the longer the henna takes to release full dye, the more stable the henna and the longer it will take the henna paste to start losing it’s dyeing abilities. c. Place a small dot of henna on the palm of your hand. Leave it for a few minutes and wipe it off. If there is a nice orange stain, you have dye release. Mix table sugar into the paste in a ratio of about 1 part sugar to 4, 5, or 6 parts henna paste. This is optional. You can mix your henna without sugar, but I find it is best with sugar. Different brands of henna may require more or less sugar. Why? The sugar makes the henna stay wet against the skin longer and stick to the skin better, thus helping you achieve a darker stain. It also helps give your henna a great consistency. You may find you like more or less sugar with different brands of henna. This is not absolutely needed, so feel free to try mixing your henna without sugar if you’d like. Mix essential oils into the paste (equal amounts tea tree and lavender). If you are mixing 100 grams of henna you can use anywhere from half of each bottle to all the oil provided. If you are not using our oils, 1/3 - 1 ounce (60-150 drops) of oil will work well for 100 grams of henna. Why? Both lavender and tea tree oils have monoterpene alcohols which will help release more of the lawsone dye in your henna resulting in a darker stain. Adding oils also adds a lovely scent to your henna and helps with the texture of your henna. Mix henna completely. Add additional lemon juice if your henna needs to be thinned. Add more henna powder if you need your henna paste thicker. You are going for a texture of anywhere between yogurt and honey, depending on your personal taste. Place plastic wrap on henna again, and set aside for 2-24 hours to allow more dye to release. With Jamila you can get away with another 24 hours of dye release but with other brands keep a very close eye on the henna. Why? Any henna, including Jamila, is able to be used after your oils have been added if full dye release had already been achieved. The reason we wait again is to allow the oils to pull more dye out of the henna molecules. Generally 4 hours is about perfect, but it’s pretty flexible. Strain the henna, if needed. Generally all henna except Jamila henna will need to be strained to avoid clogs. Place the henna in a carrot bag or sandwich baggie with the tip cut so that you can transfer the henna to applicator bottles or cones. NOTE: The colder it is in your house, the longer it takes to release the henna dye. The warmer your house, the quicker the dye release. Tip: I fill individual cones with henna and freeze them so I always have fresh henna available. One hundred grams of henna powder will create 10-12 standard size large cones (up to 24 small cones). Henna takes best on the palms of the hands and the soles of the feet. The further away from the feet and hands you get, the lighter the stain. The thinner the skin, the few layers of skin cells there are for the henna to stain. That's ok, you can still do henna on the back or even the face, just know that it will be lighter and not last as long. Henna takes best to clean dry skin. Lotions, sunblock, or even water will be a barrier between the henna and the skin. Self tanner can be exceptionally difficult for henna to bond with. The more base (opposite of acidic) your skin is the darker your henna stain. Don't use water to remove the henna from your skin. Either gently scrape it off with your fingers or a spatula or use a little olive oil or mehndi oil to remove the henna paste. Avoid water on the henna for the rest of the day if possible. Wet henna paste still on skin. The longer you leave the moist henna in contact with your skin the better and longer lasting your color. Keep the skin warm in that area to draw out as much dye in the henna as possible. Henna stain the morning after paste removal. Henna starts off light (sometimes REALLY light) but cures in your skin over a couple of days to come up to full color. Henna stain 36 hours after henna paste removal. Remember, henna is a permanent stain. It's doesn't fade away, your skin cells exfoliate off. ANYTHING you do that is exfoliating (swimming, facial cleaners, cleaning chemicals, rubbing clothing or shoes, will fade your henna design. I've had some folks interested in rolling their own Mylar cones for applying henna paste. The lovely and talented Brenda of Bajidoo has this wonderful video of rolling Mylar henna cones that I'd like to share with you. The Henna Design Gallery section of this website has HUNDREDS of henna design pictures! Copy away! Get inspired! Purchase henna design books. Currently we stock the Beachcombers henna design book, but there are others out there. Look around and find them. and take a look at the images. You'll get a ton of ideas this way! Building your henna vocabulary is a huge help if you like to do one-of-a-kind henna or if you like to connect with the energies people project. There are a number of things you can do to avoid the dreaded clogged henna applicator tips. Staining your henna is the biggest thing you can do to prevent clumps and henna debris from clogging your applicator tips. Here are instructions for how to strain your henna. Straining is done after your henna is completely mixed and dye release has occurred. It's the last thing you do before putting your henna in applicators. When I use standard henna powder I always strain my henna. When I use Jamila henna powder I strain about half the time. The Jamila henna is so fine and well sifted that straining isn't required. I still do it sometimes because straining makes it so easy to get into my carrot bag and lets me feel like I'm doing all I can do, lol! Honestly, I don't see any difference when I do strain it, so don't feel you must strain Jamila henna. Using the polished stainless steel ORa Moroccan applicator tips helps prevent clogs as well. Unlike Jaq tips and standard Moroccan tips (the ones with the plastic base), they are polished on the inside. Makes your henna flow beautifully...like butta! more likely you are to get clogs. Be sure it's still a usable consistency that you enjoy working with. I've been doing quite a bit of feel-good charity henna lately. For the Christmas holiday we did "Henna for Food" as part of a local food drive. Since the disaster in Haiti, I've done 2 "Henna for Haiti" events and included henna gift certificates in silent auctions. It's a great way to earn money for charity events and has the added bonus of directing positive energy into the world! I want to encourage more henna artists to donate their time and art for good causes, so I'm sharing some tips to make your event successful! If you require 5 food items to be donated to the food drive for each henna tattoo, be clear about that. Will you accept money instead? What constitutes food items? is a great donation amount), or if you want to charge as you normally do and donate the proceeds. Be clear on how much of the donation goes to the cause. I typically donate 100% of all money to the cause, but you can donate a percentage or you can hold back enough to cover your expenses. Do what is comfortable for you. Let customers know what to expect. Unless you want to do bridal henna for $10, let people know what they can expect fro their donation. Say a small or medium sized design or a selection of specific designs from your henna book. As always, let customers know how to care for their henna tattoo & the ingredients in your henna mix. Feel free to print up these aftercare instructions to hand out. This is for a good cause! This is the positive energy that henna is all about! Henna for a cause! It's good for the cause, it's good for you, it's good for the world we inhabit! 10/1/09 What Kind of Henna Applicator Bottle is Right for Me? Henna applicator bottles are normally the easiest way to apply henna, especially for someone new. Beachcombers offers a fantastic selection of soft squeeze bottles and applicator tips that are interchangeable. We have our soft squeeze bottles specially made for us in both 1/2 ounce and 1 ounce bottle sizes, so they are soft and can be used with either Moroccan tips or Jaq tips (both tips require a coupler to work with the bottles). Read about the differences in the applicator bottles here. Brenda of Bajidoo art has a wonderful new henna book out, "Henna Self Taught"! It can be found online from $22-$35. Lucky for us, Brenda has also made it available on CD as an e book for much much less and it includes much more! The CD book takes intricate-looking henna designs and breaks them down into easy how-to's making it easy for even the novice to create a impressive henna tattoo in just a few minutes. This book takes a no nonsense step by step approach to henna design, with loads of photos along the way. The reader is taken from curiosity straight to the "doing phase." The tattoo process is segmented into a few simple steps and "viola!" A beautiful professional looking henna tattoo is the result. It's perfect for someone new to henna, but it's also useful for more experienced henna artists. or when you have henna on your skin. I find many people new to henna get overwhelmed with the possibilities. Henna is like cooking. You always continue to learn and improve. It can be easy or it can be complicated depending on what you are looking to accomplish. You can make a great cake from a box mix easily right? You can take that same cake mix and make some adjustments to suit your personal tastes and get an even better tasting cake. It's also possible to make a spectacular tiered wedding cake from scratch. No matter which cake you make, they are all still CAKE and thus still delicious! The key with henna is to not be afraid to try new things! Relax and have fun with it! Follow these reading suggestions to give yourself a good foundation. 6/17/09 Summer Time Henna... SAFETY! Summer time means henna at the beach and on vacation. Fun stuff! This a reminder about henna safety. Henna is not black! Black "henna" is dangerous and illegal. Even so, I see people doing black "henna" at the beach every single year. Check for any chemicals or any other ingredients that you may trigger an allergy. Mixing henna is not a secret. Any good henna artist will be willing to tell you what is in their henna paste. Natural henna needs time to produce good color. If the answer is less than a couple of hours, there is likely something else mixed in with their henna. To learn more about henna safety and black henna see our Henna Safety page here. Have fun this summer, get plenty of henna, but do it safely! Ahhhh...Sping time! Spring break vacationers and henna! Now is the time that we can start really showing off some henna. Many people are introduced to henna the first time now and get hooked, of course! These new henna artists often start with pre-mixed henna, but them decide to move to mixing their own henna to achieve more control and darker longer lasting stains. Squeeze your pre-mixed henna paste into a small bowl. Add sugar in a ratio of approximately 4 or 5 parts henna to 1 part table sugar. Add some lemon juice if it's a bit thick, but not enough to make the paste too thin. As an option you can also add a drop or two of henna oil, lavender oil, or tea tree oil. Mix WELL. Mix REALLY WELL. Allow the henna sit for 1-3 hours in a warm location away from sunlight. Transfer the henna paste to your chosen applicator and you are ready to go! This is a great transition from using pre-mixed henna to mixing your own henna from henna powder. It gives you a clear idea of what kind of texture and thickness you are looking for. Yeaaaaa!!!! One of our local Orlando henna artists, Brenda of Bajidoo Art, has created a FANTASTIC "how to mix henna" video! Brenda uses Jamila powder henna (Body Art Quality) and tea tree oil. We have a discounted package price for Jamila henna, tea tree oil, and lavender oil. OK, OK, this is not a henna tip or a mehndi trick! I really wanted to share this anyway! I was delighted to have fellow Orlando henna artist, Ena, of The Henna Studio, at Beachcombers Bazaar today to apply some henna to a client. It was a lovely medallion on the left foot. That's not what I wanted to share with you. I have henna on my right hand! That's correct, I have henna on the hand that I use to create henna. We henna artists always seem to end up with a naked hand, unless you are lucky enough to be ambidextrous. Ena thrilled me with a quick Valentine henna design! I admit, she had something similar on her hand, and I thought it was lovely so I asked for that particular design. It seems we'll be seeing quite a bit more of Ena around Beachcombers Bazaar, as I've asked her to be available for henna by appointment on Saturdays, starting in March. Here's to more Orlando henna! Making Gilding Paste to accent your henna tattoos is easy! Simply mix extra hard hold hair gel with loose colored powders (mineral pigments or mica powders). Any kind of loose powdered mineral pigments or eye shadows. If you'd like extra sparkle, you can mix in additional glitter. Be sure to use ultra fine cosmetic grade glitter so that it is safe for the eyes. For the gel base of the gilding paste, choose a super hard hold hair gel. The harder hold the better. You want to select a gel that can hold up a crazy spiked Mohawk hairstyle and is hard to wash out. Water resistant gels will be the best. To test if the gel will be hard hold enough, hold the bottle upside down. Ideally, you want to see little or no movement of the bubbles inside the gel. I've heard of people using medical glue, and mixtures of hair gel and Elmer's glue as well, so feel free to experiment with different gel bases. Depending on the gel you use, your gilding paste can last anywhere from 1-4 days, though soap and water will remove it at any time you wish. The brand of hair gel will also determine drying time. I have found that the longer it takes to dry, the longer the gilding paste will stay on the skin. You can apply gliding paste with a brush, fill a mylar cone henna-style, or use henna applicator bottles to apply your gilding gel. The thicker the gel goes on the longer it will take to dry, but you can speed up drying time with a hair dryer. Gliding paste can be used with henna while the paste is still on the skin or after the henna paste is removed and the henna tattoo stain remains. Of course, it can also be used alone without any henna at all! Gliding paste is fun and easy...give it a try! We currently have the latest body art quality Jamila henna (the highest available quality) Summer Crop 2008 in 100 gram packages. As always, we store our henna properly cooled and protected from moisture and heat, so that you get the freshest possible henna for mehndi body art. Jamila powder henna is the preferred henna for professional mehndi artists. It leaves great color and is packaged properly from the manufacturer giving it a very long shelf life (summer 2008 crop has an expiration date of May 2011). It is also the finest sifted powder available. For the most part, you won't need to sift or strain your henna if you are using Jamila henna powder. As with all our henna products, Jamila henna is all natural with no added chemicals. Jamila henna powder is well suited to professional henna artists that use a larger amount of henna. It is vacuum sealed in an opaque mylar 100 gram bag inside the box. It's not as convenient as the small 20 gram bags our standard henna comes packaged in. I also find that the henna dye takes more time to release with the Jamila powder henna, and Jamila henna seems more sensitive to temperature variances. I suggest letting the henna sit overnight after mixing and if it's cold (less than 70 degrees in your house), let it sit at least 24 hours or use the warming technique below. Jamila henna is well suited to the more advanced henna mixes and can yield some amazingly dark color. The pictures you see on the web of henna that is nearly black...those likely used Jamila henna, an advanced henna recipe mix, and used a wrap and sealer to get super dark mehndi color. Your henna applicator bottles and tips can last for a long time with proper care, especially the stainless steel tips. Care is the same for Jaq bottles & tips and Moroccan bottles & tips. Avoid allowing henna to dry in your applicator tips. If you can't clean your tips right away, put them in a cup of clean water until you can clean them properly. Heat a small pot of water on the stove until it is hot, but you can still touch the water with your fingers. While the water is warming, squeeze out any excess henna from your bottles and rinse the plastic squeeze bottles completely. Place your applicator tips in the water (and the squeeze bottles if rinsing them did not remove all the henna) in the hot water and allow to soak for about 10 minutes or so. Remove your tips (one-at-a-time) from the pot of hot water and hold them under running water while using a straight pin to clean any bit of henna on the inside of the tips. Dot this with each tip until it is completely clean and you can see all the way through the tip and water runs freely through the tip. Let air dry completely before putting away. Do not put your tips or bottles away wet. 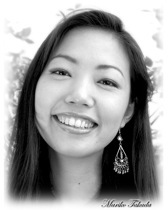 Mariko Adams is a professional henna artist right here in Orlando. She is one of the best henna artists I've ever encountered and has wonderful understanding of the art of henna. Sometimes you will find your henna is not as dark as another time you used the same henna (especially this time of the year when the temperature starts dropping). Mariko had some wonderful thoughts in this. "I ask myself some questions if I am not getting the henna color I am used to getting. - Am I using my henna for the right purpose-which is right feeling? right time? Henna is absolutely the energy from the person I do henna on. I believe henna art is energy from of person's inner beauty. I feel I am chanting while doing henna with person and bring their energy through the henna design. When I do henna I really try not to think anything. When I think or talk henna design stops and hard to draw. When I'm doing henna I totally feel person's energy and if that person is nervous I feel nervous and if that person is happy I feel great also. With many people it takes about 5 minutes to feel comfortable while drawing design and after that the design just flows out. Thank you so much for sharing this wonderful henna energy in this world!!! I feel she is absolutely right. Positive energy is an important henna component. My own attitude seems to have a direct connection with how my henna stain turns out. I also find henna is a great way to make you feel better when you are feeling down. Lose yourself in a henna design and not only does it make you feel better while doing the henna, but you have a beautiful lasting talisman of luck and protection. This time of year I start getting emails from henna artists that are not getting as good of color as they typically do. Henna can be picky about temperature and winter is a different set of challenges than summer. In summer, we have to be careful that we don't "cook" our henna. We have to keep it out of sunlight and not let it get too warm. When mixing henna powder in the summer, dye release is often much quicker (often a just a few hours will yield good dye release). Keep in mind if you have your air cranked (even to less than 75 degrees or so) it will take your henna longer to release the dye. This also means that the henna paste can lose it's dying abilities quickly, so you need to keep your ready-to-use henna cool. In the winter (even here in Florida) we have to be more patient with our henna. The same henna that would obtain full dye release in a few hours can take a full day or more in a cooler environment. I find that if my house is less than 70 degrees I need to let my henna powder mix sit 24 hours or more. I do this in stages. I mix my powder with my liquid (lemon, tea mix, or whatever I am using that day) and let it sit overnight. The next day, either in the morning or before work, I add sugar, essential oils, and any additional liquid if needed. I let that sit again overnight and the next day, I put the henna in applicators and cones for freezing. Sometimes I don't freeze the cones until the next day. This winter, keep temperature in mind while mixing and applying your henna. 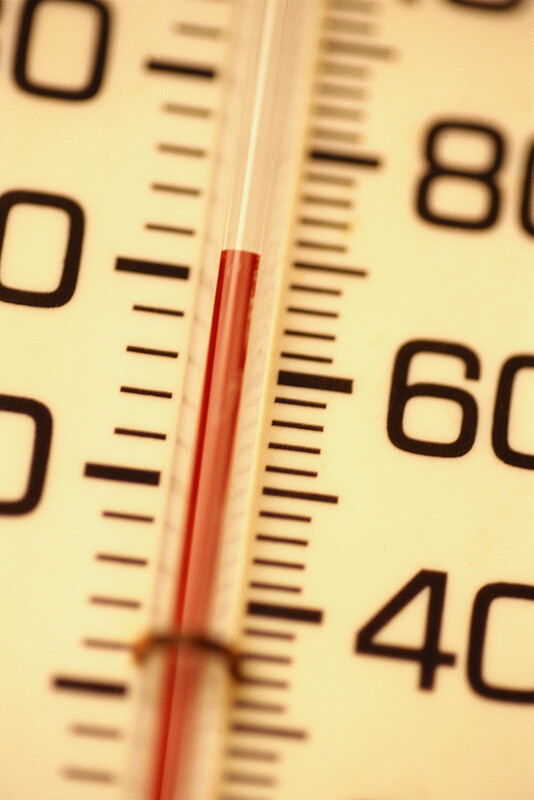 Remember, body temperature is nearly 99 degrees. Even 70 degrees is a significant difference in temperature. Stay Warm! Michael, of Clearwater Florida, is a henna artist that was having trouble with color and emailed for help. I wanted to post his follow-up email because it has a great idea for helping your henna when the temperature starts dropping. I have this thing called a "ThermiPaq"... basically it's a sand bag that you use for sore muscles and you can heat in the microwave or put in the freezer. I heated mine up for about 1.5 minutes and put that in the bottom of a cooler. I then covered it with a small towel and then laid my bottles of henna on top. 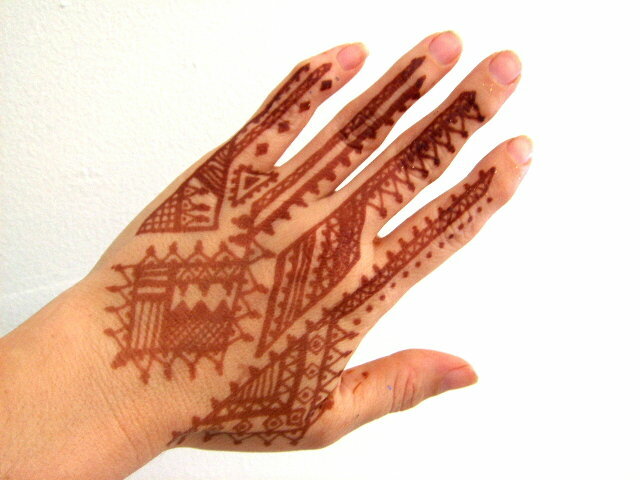 This way, the henna was gently heated overnight even though the house was cold. I did that for 2 nights and the henna started turning a dark green/brownish color. I tried it after that and it works wonderfully now. Just wanted to let you know that my problem definitely was the cold temperature in the house and needing to keep the henna warmed up overnight. Thank you, Michael, for sharing a tip that will help many-a-cold-henna-artist through the tough winter season! Just be careful that you don't use so much heat that you "cook" your henna! Ever wonder how the heck to keep you henna and accessories when it's not being used? For henna accessories such as applicator bottles, pins, glitter, and the like, I use a fishing tackle box. The dividers make perfect little compartments to store my applicator tips and bottles. For mixed henna paste, I simply use a small Corning Ware container with a lid to store premixed paste in the refrigerator. When I freeze henna, I first put the henna in empty applicator cones, so that I can thaw only as much henna as I need at a time. I apply a label to the cone with the date and ingredients, then tape over the label. I wrap the cones in a paper towel and put them in a Ziploc freezer bag. When I need to bring henna out for an event, I simply grab my tackle box and a soft lunch box where I place my henna paste. The lunch box leaves plenty of space for a couple of wash cloths and a bottle of witch hazel for cleaning skin. It has a flat outside pocket where I keep my aftercare instructions. So what's your henna set up? Kayla did her very first henna design using powder henna and on the back (one of the most difficult places to stain)! It turned out beautifully! She used Beachcombers powder henna and used the Tea Henna Mix Jr henna recipe below. Kayla has been chosen as the current Henna Design Of the Moment winner, as well. Great work, Kayla! 6/20/2008 Relax, Henna Is Fun! Don't get too caught up in getting your henna perfect, especially if you are new to henna. Henna is like cooking. Two people can make the same recipe, but have different results. Relax when you are mixing henna and don't worry about getting anything exact. My Great-Grandmother (from Italy) takes four days to make her marinara sauce. I take about an hour, lol! My sauce isn't as good as her sauce, but it's still delicious and much less stressful on a Tuesday night. Your henna mix doesn't have to be an intense-hard-core mixture every time you mix henna. Try some super easy mixes sometimes. You can get decent color by mixing your henna powder with lemon juice and letting it sit for 4-6 hours. The Beachcombers Favorite henna recipe is always a consistent easy recipe for great color. The same goes for drawing your actual design. If things aren't going well, wipe it off with water and start again. You would be surprised at how nice a design will look once the henna paste is removed and the color has come up. My point is, get in there and start doing some henna! Remember the worst that can happen is your color doesn't get as dark as it could get, or you end up with a not-so-hot design. So what? Try it again! Have FUN! I am LOVING this new henna mix so I want to share it with you! I'm going to use a sample timeline to give you a realistic idea of the timeframe. There is plenty of room for changing the instructions. They don't need to be followed to the letter. Jody's Fabulous 4 Day Tea Henna Mix! This one is a bit complicated and long to make, but I'm getting some amazing color with it. On the stove I heat lemon juice (about 2 or 3 cups, but the amount will vary greatly depending on the tea you use), loose Indian Black tea (about 3 or 4 heaping table spoons, but again depends), whole black cloves, cardamom seeds, and one cinnamon stick. Feel free to toss in whatever other ingredients you want to try out. I like to try something a little different each time I mix my henna. I heat that to a low simmer for about 1/2 hour, then I reduce the heat to low so it's hot but not bubbling at all. I leave it like that for another couple of hours then remove it from the burner and leave to sit overnight. If it cooks down too much during the heating process, add more lemon juice or water at any time. I strain the tea mixture (I actually use the same nylon that I use for straining my henna). I typically start with two 20 gram packages of henna which will make about 4 cones. Mix in the tea mixture just like you always do, keeping the paste thicker than you need. Apply plastic wrap over the henna so that the wrap is actually touching the henna and put the henna inside a kitchen cabinet (or any dark place that doesn't get too hot or too cold). Take any left over tea mix and freeze it in an ice cube tray to make it easier to make your next henna mix. Once my lemon tea mix is frozen, I put the cubes in a ziplock bag labeled with the date and ingredients of that particular mix. Stir your henna mix and add sugar (2 or 3 teaspoons). Add your oil. I've been loving tea tree and lavender lately. I typically use about 10 or more drops of oil for 2 bags (40 grams) of henna powder. Add additional lemon juice if you need to further thin the henna. Put plastic wrap back on henna and put it back inside a kitchen cabinet (or any dark place that doesn't get too hot or too cold). Strain your henna, add it to an applicator, and you are ready to go! I use the carrot bag from straining the henna paste to put the henna in cones to freeze. Two 20 gram bags of henna will make about 4 henna cones. I label the henna cones with the date and ingredients before freezing. It takes about 2 hours for one cone to thaw. Keep any unused henna refrigerated for up to a week. For longer storage put it in an airtight container and freeze it. Monday - Make the same lemon tea mixture from the above 4 Day Tea recipe (use whatever you want, it doesn't have to be those exact ingredients). Simmer the tea for an hour or so (add more liquid when needed) and set aside to cool. Once cool, strain the tea and mix your henna, just like the Tuesday instructions above. Tuesday - Use the Wednesday instructions above and add your sugar and oils. If you do this in the morning, you can use the henna in the evening, otherwise let it sit until Wednesday. Hope these new henna mixes do well for you! Email me with your mixes and I'll post them! I have recommended adding tea tree and lavender oil to your henna mix for a long time. I've been hearing from customers that they have a tough time finding high quality oils and when they do, they often have to pay high shipping costs. Alright, you got it! I've found a great supplier of high quality Australian tea tree oil and a very high quality French lavender oil and am offering it to you! Now you can get your essential oils for henna when you get your Beachcombers! henna powder and you can add it to any order for no additional shipping costs. Each bottle is 5 mL and is dark glass, so they will store well for up to three years. Five mL is about 60 drops of oil. Each 20 gram bag of henna needs about 2-5 drops of oil, but you can add more or less depending on your tastes. The oil is 100% pure uncut, so a little goes a long way. BTW, we are also offering a new Henna Straining Kit so that you can strain your henna. We found that people were having issues getting all the different components of the kit without spending excessive money so we put a kit together for you. It contains nylon stockings, extra strong carrot bags, a spatula, and instructions of course. I hope offering these oils and the straining kit is a convenience for you! Continue to let us know what your needs are and we'll stock what we can. You may have heard me mention that henna is a natural sun block in the past. Well, here is proof! If you look closely at the foot on the left, you can see the reverse of the henna pattern that was on the skin before a couple of days vacationing at the beach. The henna stain was barely visible when the wearer went on vacation to the beach. The henna was done by Courtney, and she was kind enough to send pictures of the ultra cool sunblock results. Last week we went to a eCommerce Business Summit in New Orleans, LA. Aside from the fact that the summit itself was a wealth of information, allowing us to continue to improve your shopping experience with Beachcombers Bazaar, I also did some henna testing! We drove from Orlando FL to New Orleans in an old Miata with no air conditioning. This means my henna was in a hot car for more than 10 hours! I always tell people to put their henna in a cooler when doing henna outdoors to keep it fresh, but I purposely did not do that with my henna. I never dreamed that the henna would still leave color after that kind of abuse, so I was pleasantly surprised to find that after 10 hours of driving in the trunk of a car in Florida, and another 24 hours of sitting in a hotel room, the henna still left color! It wasn't great color, but it was color. < The picture to the left is of the henna the day after it was done. The color changed from orange to a darker brown the next day, but I don't have pictures of that day. The skin was not cleaned before I did the henna, but I was able to use a lemon sugar sealer. Certainly NOT the best conditions to do henna, lol! The heat did cause the henna to separate, and luckily I had a toothpick long enough to properly mix the henna in the applicator bottle. I was reminded of how important it is to completely clean applicator bottle tips. I thought I may be able to get away with using a straight pin to clean my stainless steel applicator tips without water, but I started getting clogs as the fresh henna mixed with the dried henna that was clinging to the inside of the tips. I used hot water from the hotel tap and a straight pin to properly clean my henna tips and the clogs stopped. Clarissa of TattooApparel.com and Andy of Debnroo.com. Courtney (Orlando henna artist) has been using Vitamin E Oil to keep her henna design moisturized. We have likely learned by now that henna likes nice dry skin to develop color, but once your tattoo is set, if you don't keep the henna tattoo moisturized, the skin cells exfoliate quicker, thus fading your tattoo. Keep detailed notes on every batch of henna I make. You'd be surprised how quickly you forget exactly what was in that last batch of henna that left really great color. Write down new henna mix ingredients you'd like to try out. Doodle henna designs and try out new designs. My henna notebook is my little brainstorm area. Sometimes, people want a specific design hennaed on them. I let them draw it out in my henna notebook. I'll also pre-draw out a design for a customer if they are a little unsure of what they want. This gets them excited about their henna tattoo! I found some great notebooks for henna at Michael's Crafts for only $.50 in their clearance section! They are 8.5" x 5.25", spiral bound, and have a great paisley floral design. The notebooks are lined so it can help when drawing out a symmetrical design for the first time. They also had matching note cards and Post Its. These are my two favorite terping oils for henna and I suggest them often. Apparently they are not always easy to find, so we've decided to start stocking them for you! Keep your eyes out for us to add high quality tea tree and lavender oils to our site. If you have not already signed up for the Preferred Clients list, I encourage you to do so, in order to get an email when they are available. First, thank you all for coming to the workshop! It was a great success and I had more fun that I thought possible while "teaching", lol! I promised to create this follow-up info so that you'd have access to some of the things that came up in class, so here it is. Courtney showed us a fantastic product to use for wrapping your henna, a self-adhesive elastic bandage called SureFlexx. It's a great way to wrap your henna without looking like your broke something, lol! It comes in a great selection of colors and is found at feed stores. Apparently it is used for horses. I found some online sources for it, Provico, and ValleyVet. I have not ordered from them, I just did a Google search to find them. Courtney found a local supplier here in Orlando that sells SureFlexx for $2.25 each or if you buy 4 or more rolls the price is then $2.00 each. When using this to wrap your henna design, seal your henna, wrap with tissue/bathroom paper, wrap with plastic wrap, and then cover with SureFlexx. When using oils in your henna mix, be sure you are using pure aromatherapy grade oils. some oils are pretty harsh so be sure to test new oils before applying them in large quantities or on others. Cinnamon, clove, and black pepper are examples of harsh oils. Lavender and tea tree are mild oils. I get my henna oils from Leaves and Roots on the East side on Orlando on Colonial Dr. They have a huge selection and have a great website if you know what you are looking for. Susan and Nikki mentioned Sun's Eye Oils as a potential source for essential oils. You can visit their website at SunsEyeStore.com or they can be bought locally at Avalon located on Hillcrest at Mills or Spiral Circle located on Thornton near Colonial. We briefly talked about decorating your henna with glitter paste and gilding paste. I talked about using eye shadows and theater powder make-up to make your own gilding paste. You just mix the powder with hair glue or very thick hard hold hair gel. The gel should be thick enough that when turned upside down a slow bubble will work itself back up. It should not be "pourable" gel. Susan makes the very best gilding powder (Eyegasams) I've found and at a much better price than theater makeup. Each pot of powder is only $7.50 each! She is working on getting a website up soon, but you can contact her via email here. If you dance at the YOU Center with Lacey, Susan always brings her powders to class so you can arrange to purchase them there. If you are interested in loose glitter to sprinkle over your henna, I've found that extra fine scrap booking glitter work really well. Don't use craft glitter that is made of metal because if it gets in your eye it can actually cut your eye. The scrap book brand Stampendous has non-metal glitter. I've bought this brand at Michaels Craft Store in the past, but the last time I was there I didn't see it. I've emailed the company to ask where else we can get their glitter. I used the glitter paste yesterday and got a little overzealous with it! If doing an ankle design or the side of a foot, flip a small trash bin up-side down and have them prop their foot on that. It brings your work surface to eye-level when sitting on the ground and will help with neck strain. Instead of drawing stick figures or smiley faces at your next boring business meeting, doodle out some henna designs! Practice the basic shapes (bumps, clovers, waves, etc.) repetitively on paper until you can easily draw them in a pattern. This will help with size control, symmetry and placement when using henna. If you are in need of design inspiration, look all around you! You'd be surprised at how many designs you can find in ordinary items we see everyday. Look at your calendar, magazines, the shape of a vase or even the pattern in a bed spread. There is inspiration all around and things may start looking a little different when you start looking for it. Now that you know just how simple henna designs can come together, start searching for anything that can be combined with the basic shapes to make beautiful works of art! Be sure to keep a journal of your design ideas as well as recipes. Sketch, doodle, take photos or simply describe in words what you see, what you have used in the past, what works or not, what clients like or dislike or what you want to try next. Refer to this information when making your own designs or elaborating on the good 'ole standards. It's really fun to look back through the pages as your henna skills improve to see just how far you've come! Have fun, make mistakes, learn from them and let the creative juices flow!